FAB is a quick, refreshing way to stay energised and alert all day long. 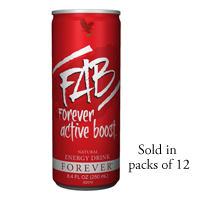 FAB gives you both immediate and long-term energy, with natural ingrediebt guarana, and ADX7 technology: a proprietary blend of adaptogenic herbs and nutrients. Contents: 12 x 250ml (8.4 fl oz). Directions: Shake gently before use. Served chilled. One to three cans per day.